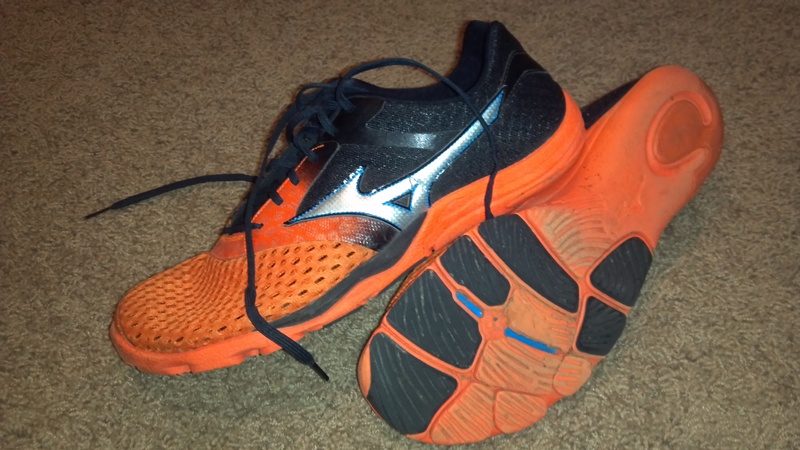 I have been meaning to post about this shoe for a while now, certainly before getting to 127.36 miles in them. It just might be the best zero drop trainer I have owned, becoming the shoe I am mostly likely to put on for a long run. On the other hand, they feel just a little too klutzy to me to race in. 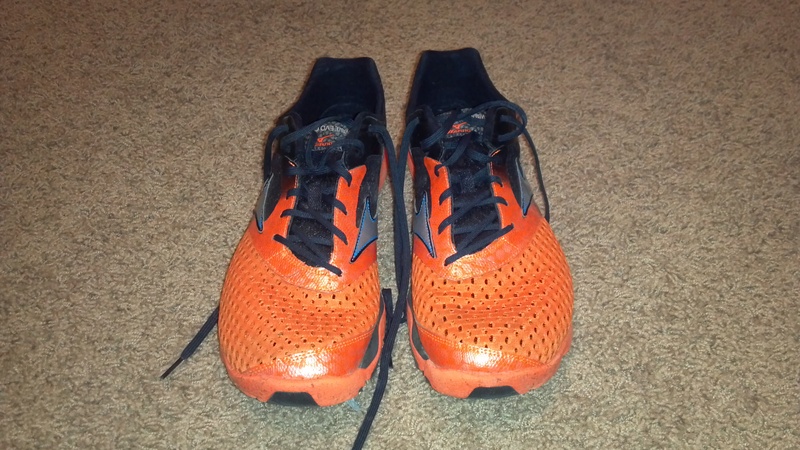 I came to this shoe early this year after taking my annual 1 month break from running (subbing in elliptical) and looking to put a little more cush between my foot and the pavement for those winter runs outside. I had been running in some New Balance MR00s but my feet were still a bit achy from two fall marathons and the training leading up to them. According to Mizuno, the shoe is named for Eudibamus Cursoris, one of the oldest known bipedal creatures. Of course Latin scholars will immediately know the meaning of this name: “original runner on two limbs.” Having viewed some artists’ conceptions, the little guy looks pretty speedy to me. I think the shiny material on the upper around the laces (click the pic for a larger image) was intended by Mizuno’s designers to look like dino skin, but I can’t prove that! As to that Wave plate, I don’t notice or feel anything most of the time, but at one point in the second half of a recent long run I did have the distinct sensation that I was loading it up and feeling some compression and rebound. 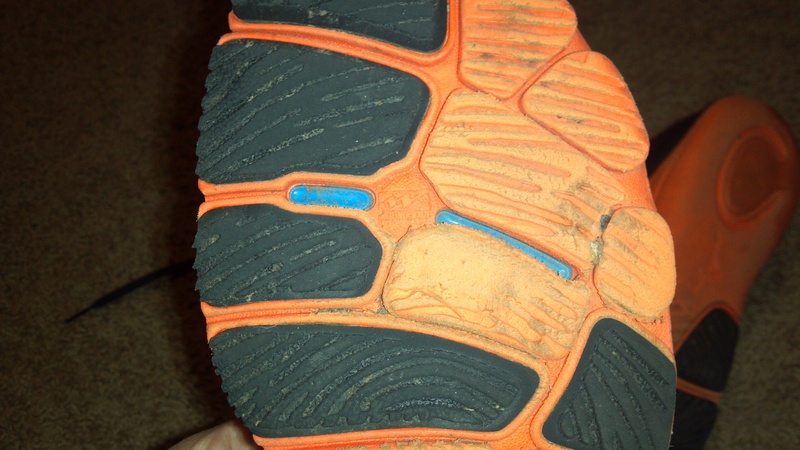 The shoe isn’t exactly tearing itself up at 100+ miles. In fact I’d project it to be fairly durable despite the visible peeling in these pictures. I don’t foresee any problems getting the “traditional” 500 out of it, but then again I’m not pitching…err…donating shoes at 500 miles anymore. I am someone who admittedly agonizes over shoe fit. Years ago, I used to dogmatically buy shoes in “my size.” Being older and wiser now, I’ll try on at least the half size up from “my size,” or down as the case may be (I recently bought some very oddly sized dress shoes that took me down a full size, creating a great deal of cognitive dissonance). This shoe convinced me to go a half size up. I really like its roomy toe box. I think I have the right size for me. However, I just can’t shake the feeling of a certain amount of clumsiness. 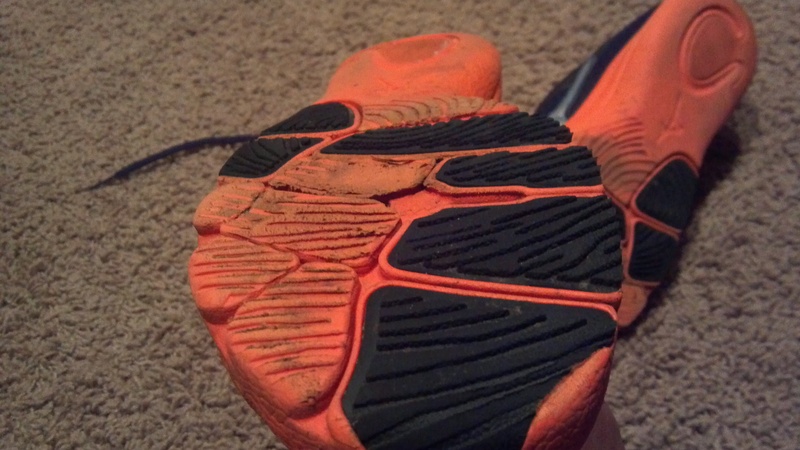 I have run in other wide toe box zero drop shoes without this problem, notably the Instinct. For whatever reason, I seem to be magnetically attracted to at least one pavement heave per long run in the Cursoris, much to the amusement of passerby, no doubt. The shoe is light, but doesn’t “feel” fast, I think because there’s so much of it there. In saying that though I feel like I am asking the shoe to be something it is not. There is another shoe in this line, the Levitas, which is supposedly more geared towards speed, with the attendant sacrifices in cushioning. Perhaps I will give it a try at some point. Update 05/22/13: These now have double the miles of when I wrote this review: 259.39. They’re still holding up well, with no signs of nearing the end of their useful life. I find myself going to this shoe almost exclusively for pavement training runs (my rotation in the last month has been these and barefoot). I still catch pavement heaves in them from time to time, but overall I’m very satisfied. I’m busy. Sure, we’re all busy. I’m no busier than you (more on that in a minute). Some weeks you have to be a little creative to cram in a run or a workout without sacrificing those precious minutes with your family. For many of us, that means just getting up a little earlier than we’d like to. For others, it means staying up later than we should. Personally, I have no idea why hitting the elliptical at the gym at 5 am seems to be more socially acceptable than at 11 pm, but that’s just me. Running when the kids are in bed has always been my preference. I have both headed out the door after dark and arisen for morning runs before first light many a time. However, there are times when lack of sleep, meal schedules, and other activities just render that impossible. Such was my theme for the week. Tuesday was a scheduled 8 mile Semi-long workout for me. A 2 mile warmup, followed by another 6 miles at a faster pace. The only “available” time slot? My son’s soccer practice, indoors at an elementary school. (Too bad – running barefoot around the plush soccer fields at Lone Elm Park is one of my faves – c’mon spring!). I could have driven over to the gym and hit the ‘mill, but that would have cost me 5+ minutes at either end. Instead, I was glad to find that the school had a super-long main hallway and a friendly custodial staff. It was boring, but I got in a solid hour of going back and forth. I didn’t count, I didn’t measure, and I didn’t bring my Garmin. I just went by feel and tried to keep my pace up with rhythmic breathing (something I have written about before – I didn’t know it had a name and devotees until this months Runners World article!). Pretty sure I got the 8 miles in. I also popped into the gym periodically to check in. It worked great – much better than a drop off and pick up. Thursday had a 7 mile tempo run on the slate. My son caught wind that I was was headed out as soon as I got everyone in bed and pounced: “Daddy, can I run with you?” Cue Harry Chapin. There have been times when I have said no. Usually I have a “good” reason – it’s too late, I’m going too far, etc. Some reasons are about the kids, some are about me – admit it. This time, I’m glad to say I didn’t hesitate. It was about 8:30 pm. He had school tomorrow, but it was the last day before spring break. It was cooling off, but the temps had been in the 70s and there was that glorious post-dusk vacillation of warm air currents and cool valleys. Why not? Yes, I said. Let’s go for a run. We did a 3 mile out and back. Our pace was slower than I would have run for my warmup if I had been by myself, but I boosted my effort by carrying the conversation. After dropping him off, I headed back out for the fast-paced part of the tempo run – 3 miles with a mile cool down. I did that as a 4 mile out and back. Finding the time and effort to say yes when your kids get excited about running is worth whatever you give up in terms of minor personal goals for a workout. Finding ways to spend more time with family and still squeeze in your run is always worth it – whether that’s running at weird times or in weird places! The Count’s point is not that our lives are devoid of meaning. I choose to think that we must strive to capture meaning through the estimation of others – not our own! I headed out the door Saturday for a long run in Columbia, MO, where we were visiting my in-laws. I have a few routes I enjoy there, but with the snow they were out, so I planned on sticking to places I knew would be plowed. There is nothing simpler than planning an out-and-back. Here’s a quick primer: (1) decide on total distance; (2) start running in one direction until 1/2 of total distance is achieved; (3) turn around and run in the opposite direction. Seemingly condescending sarcasm aside, it did remind me how much more fun a loop can be since you’re not retracing your steps. With a little planning, you can get pretty close to your target distance, and you never have to look at the same scenery twice. On the other hand, the simple out-and-back has its virtues as well. Even on an unfamiliar route, it’s familiar on the way back, so you can push a hill knowing what lies beyond, or slow the pace as needed. On this run, I had at least one happy coincidence. First, my planned distance landed me literally at the doorstep of Mizzou Arena as a turnaround point. There aren’t any steps, so the Rocky music wasn’t going through my head, but it was inspiring to be threading between Hearnes and Faurot Field as well. This is a two-for-one post, so turning my stream of consciousness to the other topic: long run hydration. I hate those belts. I tried one once. Once. I just couldn’t deal with all the flopping around and riding up, etc. Of course I wouldn’t have even tried one if I didn’t hate having stuff in my hands while running. Lately, I’ve been mapping out long run courses that go by a convenience store close to my turnaround point. I’ll make sure I’m good and hydrated, head out the door with a couple of bucks in my shell, and zip in for a quick apple juice at the halfway point. An alternative would be a to join a running group that sets up aid stations for Saturday long runs. I know there are a few. I have been tempted to bandit their offerings at times on the Mill Creek trail, but so far my conscience has won out. Another way is to drop something at your turnaround point in advance of your run. I’ve done that too. Anything to avoid weight in my hands. It just gives me the feeling that I am unnaturally altering my form when I’m lugging a bottle or two around.